I’ve been on a pretty low calorie diet and when I’m finished would like to maintain this new level of body fat. I’ve been slowly chopping calories down over the course of about 5 months. As of right now, according to the Harris Benedict formula, I’m approximately 700 cals under maintenance for 6 days a week, 7th day is a refeed. Are there any guidelines for how fast I can increase calories back up to maintenance so as to avoid any fat gain? I would basically start slow. Add in 25g of CHO & 5g of fat per day and wait to see how much weight you gain… likely it will be around a half pound simply from water & glycogen, once you plateau for a few days, increase it again by the same amount… and so on and so forth. On research that studies the effect of fat gain when returning to maintenance from a restrictive caloric cut. I was hoping there might have been some specific research on this but I suspected it would be a case of trial and error, as most things are. It would be quite an interesting study. I wonder whether it’s possible to get fat by jumping straight back up to maintenance calories after a restricted diet? As far as I understand, all the fat storage mechanisms become super sensitive when the body loses a significant amount of adipose tissue (and I’ve lost about 22lbs). Given this, I guess getting fat wouldn’t be out of the question, though it seems unlikely from just maintenance calories (calculated using the Harris Benedict formula for the new weight). How would you conduct that as a controlled study? There are so many variables it would be mind boggling to conduct… not to mention nobody would fund it. One of the big pitfalls of diets for many people seems to be regaining weight afterwards. Coupled with that seems to be a scarcity of information on how to come off diets and maintain fat loss if you’ve been very low calorie (at least I’ve seen little written about it). Hey layne, do you feel your joints are a little more fragile while dieting? For instance, my knees give me problems when dieted down on things like lunges, and close stance squats. Also I have little things pop like my elbows when I stand of a chair or I can crack my back and neck when low in bodyfat. I’m going to start jumping on the glucosamine wagon soon but I just wonder if others who get low in bodyfat also get this stuff. Also, as you might guess my normal body type is kind of chunky status so my body is not happy at low bodyfat. So maybe that has something to do with it, eh maybe not. Overall it is much different than what I do… that said I do think there is more than one way to skin a cat, I tend to not be as carb phobic as chuck, and while cutting carbs may be the best way to lose fat quickly, I prefer to keep all aspects of muscle retention, performance, how the diet makes you feel, etc in mind as well. That’s what I love about Scivation though, they don’t mind that my opinion doesn’t necessarily always agree with theirs and I think that’s good for the company, makes me examine their points of view, and they examine my points of view. Just a quick question for you, do you adhere pretty close to the “Cut diet”? I just printed off a copy and have been reading it while on the treadmill. Basically, I’m working my way down to 12% BF (as suggested, currently 15.7%) and then I was thinking about actually starting the real ‘contest’ diet. Hey Layne I was wondering. what are your views on Dave Palumbo’s diet which is a you probably already know high protein, mod-high on fats, and no carbs with a refeed every 6 or 7 days? Do you think this dieting strategy would work with natural athletes? The bodyfat setpoint. Can it change in a good way or getting worse with age? There is very little anecdotal and no scientific evidence to suggest that you can lower it, but you can certainly make it higher if you let your bodyfat get too high (only if you go significantly over your normal bodyfat). Layne how much creatine would you recommend for me? I’m currently 230lbs. Also, I’d like to start eating up to about 300 grams of protein a day. How do you think I could accomplish that when I already eat around 40 grams of protein per meal, every 3 hours. 5 times a day. By my 5th meal i’m going to bed, and that’s usually a protein shake. So I don’t know where to fit another meal in without eating less than every 3 hours. Would increasing my intake to 50 grams per meal be a good start or even worth it? Layne, is there a specific reason you prefer to use total bodyweight when calculating macros instead of lean body mass? DAMN, Nick eats really little…that has got to be way under his maintenance, even without all the cardio…how does he manage to add muscle? What’s his strength like compared to yours Layne? I’m amazed he can even get through a workout on that caloric intake. I don’t really know, even though the series says we are workout partners, we don’t workout together all that often. I’m stronger than him but I also weigh more… comparatively I really don’t know who’s stronger lb for lb. Nick lifts hard but our styles would clash too much to be partners. Layne what are your thoughts on cheat meals and what would you normally have? a “bulking” diet of 3,500 cals doesn’t seem like much of a bulk unless your metabolic rate is slower than average and Nick’s 2,000 cals a day is crazy, lol. It’s what allows me to gain at the appropriate rate. I’m not one of these people who goes crazy with 5000 kcals because I want to see the scale move. typically not a big fan. I actually was asked the same questions as him by Jamie Hale. I’m suprised he posted it in his blog… it was supposed to go in Jamie’s book. I didn’t know that. Does this mean that you count fiber as a carb in your diet? Yes, I do count all fiber just to make it easy & be safe. As far as nutrition counters they are probably all accurate. You see within the same food there is a large variability in how much protein carbs fats it can contain (usually at least + or – 5%) so they are probably all right lol. The key is to just use ONE source for your macros so that you will be consistant. That is the most important thing. Question about your bulk cycling. Do you up the cardio for the 2-3 week cut part? or do you pretty much leave your training the same and let the food the work , just talking the 2-3 week cut not for a show , im sure for a show you bump up the cardio. You do about 500 cals over maintenance for 4-8 weeks during the bulk and 500 lower maintenance for 2-3 weeks during a cut? how do you find out your maintence calories? In one of your bodybuilding.com videos (I think the first) you talk about how u train as a natural. It was something along the lines of 1 week gain 2 next week cut 1 lb = net gain 1 lb lean mass. he lbs may be off from what u said but thats the idea as I understood it. How often do you cycle these bulk vs cut weeks like 1 week bulk vs 1 week cut *repeat*? Most curiously does your training stay the same on both as far as weight lifting.? Im thinking low-carb = u should not do heavy compound moves like deadlifts and squats but i could be wrong. I assume more cardio on the cut days as well as a drop in cals (esp carbs)? i have a question about the 4 weeks bulk 2 weeks cut i heard you talk about on no bull radio. ive been following daves cutting diet and just finished up there 2 weeks ago and got great results, but i really want to stay lean now all year round, my diet at the moment is 300g protein 200g carbs and 140g of fat, im 200lb 8%bf ish. so if i stay eating like that for 4 weeks, how would the diet look in the 2 week cut, hardly worth my while dropping the carbs out for 2 weeks. im also doing 50mins cardio 5 days per week berore breakfast, should i up this on the 2 week cut. been trying your rotating bulk, cut model. my question is how much does your weight fluctuate during the cut phase? the scale doesnt look like its moved during the first week but i think i do see some signs of increased vascularity. i am happy enough with the strength, just not sure if i expected too much out of the cut phase. what was your pro/carb fat intake during the bulk and what is it during the cut? i am no longer sure what my maintenance intake is, i dieted for 26 weeks for my show then stayed on for another 6 weeks while waiting for a photoshoot. i expected 200/200/60 to be my cut and i was planning on going to 200/250/75 for my bulk. but i actually hit my offseason weight cap doing the 200/200/60 i will admit it wasnt a clean cut but i also haven’t been sleeping very well. since i was already at my weight cap i cut down to 200/125/60. i also increased the intensity of the post workout cardio, adding a series of sprints every few minutes. got some quality sleep last night and looks like im down a couple of lbs for the week… which is what i expected. so i am guessing my metabolism is still a bit weird after the long diet coupled with the post diet food party?? but im sure my sleeplessness isnt helping any either. have to find that brain ‘off’ switch. 1. When doing the 2 week cut cycle, is it necessary to have the refeed day(s)? 2. When bulking, on off-days (no cardio and no workout), is eating 200 calories above maintenance a good idea? Or is it better to bring it down to maintenance on that day? I eat an avg of 500 above maintenance throughout the week. Btw I’m seeing very good results after bringing down my protein intake to just above 1 gram/lb, starting to train everything twice a week with crazy intensity thanks to your inspirational videos, and taking 30 g BCAAs daily. just wondering with your cycle of bulk for 6-8 weeks then 2 weeks of cut, when you go back to bulk do you raise calories right back up or introduce slowly again? going on previous conversations on this thread if you raised them right back up you would raise the posibility of storing fat. interested in your thoughts again? 2) I have been trying your 4-6 week bulk/ 2-3 week lean gain plan. I had been bulking at around 2800-2850 calories for 6 weeks and did not put on much size, I then cut at about 2500-2600 calories for 2.5 weeks now, and feel like my strength is beginning to go down, Do you think my body is ready to start bulking again? In your video you suggest taking cutting 1000 calories or more out right away when going from bulk to cut, arent you worried about losing a significant amount of muscle? no, the whole ‘don’t cut calories fast after a bulk you’ll lose muscle’ is nonsense in my opinion. Due to the hormonal mileau and metabolic situation that occurs while bulking, immediately post bulk is the best time to drop calories fast if you are going to do it. Especially considering you are only doing this for 2 weeks.. you are trying to TAKE ADVANTAGE OF METABOLIC SWINGS, if you drop calories super slow you won’t do that. Hey Layne, speaking of your 2-3 week cutting phases, do you carb cycle during these or just keep carbs constant? Layne , what % of total calories do you feel should come from fat so you don’t have a deficiency over load in your diet? I don’t like %s because they don’t hold up over many different calorie ranges. For example. If you are doing 10% of your kcals from fat I’m sure everyone would say that is deficient. But if you are taking in 4000% kcal/day thats about 45g of fat which is certainly not deficient, especially because you have so many total calories to spare fatty acids. However, if you are on 1800 kcal/day that ends up being only 20g of fat which is less that optimal; especially at such low calories (unless you are a 100 lb figure girl, then you’re probably ok) So I don’t think there is a % you can put on it. It depends on weight, age, activity level, bodytype, caloric intake and other factors. I think for your average sized adult male bodybuilder with a mesomorphic bodytype who’s in a caloric deficit, 45-60g of fat does the trick. When bulking you can actually go with the same amounts or less due to the increased kcals; however, that means you have to eat a ton of carbs as energy fillers and I like a balance so I suggest 55-75g of fat. These are just general guidelines, I hope they made sense. I see what your saying , cause if your getting like 30% fat on a 4000 cal diet thats like 135 grams of fat , i would have to eat alot of oil to get that in my day. in other words from watching the vid and listening to no bull radio , with protein , when bulking 1 gram per pound , if your older 1.2 grams peround would do the trick , when cutting keep the protein a little higher than 1 gram per pound to make sure no catabolic issues occur/curve appatite. carbs – just a filler to reach caloric intake. would this look like a good start? anyway just thought i’d tell you that i was going to give that model a try. im a little leery of going up 500 cals above maintenance for the bulk phase so i will start off with a more conservative 200 above and below. sometimes its can be just interesting to find new ways to grow. I think 200 kcals might be too little over… try 300 i think that would do it. If you add weight too fast then back off a little. Hi Layne. I am getting ready to do my first INBF show. This will be my third show ever. My last 2 shows I dieted for 16 weeks and went from about 235lb down to 197ish both times and still came in smooth. I dropped steady and tried not to loose too fast because they say loosing too fast will cause muscle to be burned. This time I cut way harder, my carbs went down to 100-150g, I left my fat at 35g and pro. at 400g. I lost extremely fast (around 6lb per week) I am currently 5’10 210 and leaner than I was when I weighed 197. I still have 10 weeks to go. The only supplement change I made was adding leucine to my preworkout meal. Do you think its the leucine or does my body do better with loosing weight quickly?? I get fat EASY!!! Thanks bro. Tomorrow is my re-feed day (excited about that). Even though it is a day off from lifting, since I train first thing in the morning, I thought this would be best done the day before a leg day so Friday morning I have a ‘full tank of gas’. When doing HIIT, I know you do a PWO shake like lifting, but do you do a pre workout? I am going to have a solid meal in me at least an hour before. As I’m enjoying my refeed day, was wondering if you have seen or heard any studies about increasing Leptin/T3 with on large meal verses spreading the extra carbs out over a whole day? I would think that spreading it out is more effective as you are less likely to add bodyfat, plus replenishing glycogen would also be hampered I would think too. Just curious if you have seen anything or have an opinion of a day long refeed verses one or two big carb meals. When do you think it is optimal to introduce any kind of weekly refeeds? If so what body fat you think would be ideal to start them? Do you think it would be beneficial for me to have some extra carbs tonight before bed since I train early or should I just have the increased carbs for the rest of the day after I lift? I am moving my refeed day for tomorrow (leg day). is it a good idea to leave dextrose in your whey shakes when you are on your 2-3 week cut? i have cleaned up my diet but have kept 15g preworkout and 35 pw of dex. i only take on weight training days 5 times a week. when you are deep in your diet do you still train everything 2 a week or move to once a week since your carbs are reduced? Hey Layne, I was wondering when you are bulking do you eat carbs with every meal. I usually have breakfast, train 90 minutes later, have a shake with whey and waximaize postworkout, eat a whole food meal an hour later and then still eat 3 or 4 more times throughout the day. Would you suggest having carbs with every one of those meals and even the shake right before bed or would you say to cut them out of the last 1-2 meals when I am just basically just sitting around on the computer. I’ve heard you say this before. I agree that if you do evening training or cardio (HIIT esp) you need to replenish the glycogen with some carbs. My question is though if you do no training in the evening, wouldn’t you want to minimize the carbs (veggies at best)? My thoughts are to keep insulin levels low during this time period. Granted, if I worked out in the evening I would take in carbs up until bedtime. This is in the cutting phase verses the bulk phase. Bulk phase, carbs all day baby! yes but by that same token if you train at night, i would minimize carbs earlier in the day… it has nothing to do with the time of day. What about if you train first thing in the morning? should you have carbs the night before?? Hey Layne, I just started college and I usually train after breakfast, which I now eat at the dining hall. My question is do you think that it would be bad to eat a plain bagel with my breakfast, which also contains protein and fats(eggs), or would that be okay. So do you believe as long as you’re hitting your macros you can pretty much eat whatever u want? When going on a cut, do you think it would be wise for a trainee to start carb cycling or adding in refeeds immediately or would it be better to just drop the cals week to week. I was told by someone that if you immediately start carb cycling, your body will adapt to carb cycling in a few weeks…and when you plateau, you have no other alternatives. However, I was under the impression that carb cycling keeps you from plateauing and even prevents your metabolism from slowing due to the high calorie/carb days. Joel Marion of “The Cheat to Lose Diet” stated that leptin levels drop after about a week of caloric restriction BUT it only takes 1 day of refeeding/cheating to restore leptin levels. If this is the case, I think that people who are trying to get ready for a competition would not really have to lower their caloric intake as much because they could avoid the body plateauing and therefore….having to recover from a contest would not have to take as long. Do you agree with this? Since the palumbo layne debates I’ve been looking at both your guys’ diet plans and nutritional styles and comparing contrasting etc….and I can see merit to both contest prep plans, and they both are well thought out…but in terms of offseason diets I am curious on your thoughts since I am only familiar with your contest prep techniques…and to be clear I am not looking for an individualized plan and I certainly hope this isnt info that youve put out there before…I am just looking for your thoughts on Palumbo’s off season methods. Palumbo advocates a 1.25-1.5g/lb protein, 1-1.5g/lb cho, and .75g/lb fat diet with an emphasis on healthy fats and quality protein for an offseason growth phase with minimal fat gains, also keeping the majority of carbs around the workout…what do you think of this? If still in a sufficient caloric surplus, and getting enough cho to fuel workouts and replenish glycogen stores, is there any downside to keeping cho this low on a bulk, and why? it really depends on a lot of factors. I don’t think there is ‘one diet’ for anyone.’ for example, I think your first priority is protein; 1g/lb-1.3 g/lb should work fine… for younger more insulin sensitive people choose the lower end; for older less insulin sensetive choose the higher range. Then I would look at how many calories you need to gain weight at the appropriate rate and fill in with carbs/fat. Again for younger, more insulin sensitive people I would keep fat lower and keep carbs higher as carbs will actually have an anabolic effect in younger (<18) people. For people aged 20-40; I think you can fill it in more liberally in terms of putting in how much fat/carbs you want so long as you hit your calorie goals. for people older than that I would go with more fat/protein & less carbs. Let’s be clear on a few things as well. I don’t like a LOT of fat while bulking as regardless of carbs intake if you have calories high enough you are going to store fat and regardless of what some people say, fat does NOT need insulin to be stored in adipose tissue; it has carrier proteins that are insulin independant that can bring it in just fine. Also, fat is more satisfying on a PER GRAM basis. HOWEVER, fat also has over 2x the caloric density of carbs and if you break satiety down to a PER CALORIE, what you find is carbs are actually MORE SATISFYING per calorie than fat. Think about it. 180 calories from peanut butter is only 2 tablespoons (32g weight) of peanut butter, whereas if you look at 180 calories from rice, that’s over a cup of cooked rice (over 100g cooked, over 50g uncooked). People don’t think about these things in the proper context many times. 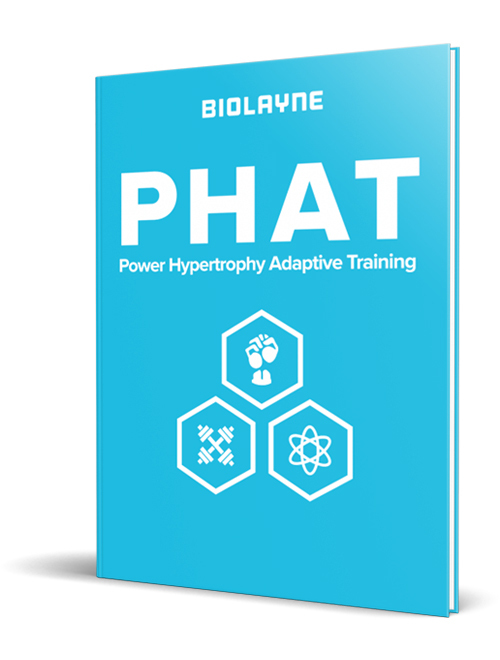 Layne, besides the insulin sensitivity, age and satisfaction per gram factor, do you think adjusting carbs intake in regards to the volume one’s training would be wise? I mean, obviously you need more carbs when performing Arnold’s routines, than for example a DC two day split. And if this statement comes out to be relevant, what would you in this case recommend in terms of macros breakdown for low volume trainers with average/low insulin sensitivity? I think that if you were training lower volume and had poor insulin sensitivity trying to gain muscle I would probably not go over 250-300g carbs & fill in extra calories with fat. I consume a lot of eggs, especially the whites, first because I like them but also cause they’re cheap. And I know why the cheap ones are cheap; mass production of eggs is done in horrendous conditions, and the animals producing those eggs are totally debilitated. So do you know how much their condition affects the quality of the eggs? And are there any theories (I’m just making an hypothesis here, and maybe splitting already splitted hairs, lol) that show that the toxins/anti-biotics/etc… are found more in the yolks, or more in the whites or equally dispersed? Layne, I’m reading this article…http://www.bodybuilding.com/fun/layn…lculator…and I’m wondering if a woman can use those same calculations/values or would I need something different? Do you work with women? In your opinion, do you need to alter your plans to accomodate women? Thanks a bunch. By the way, I love the video series on bbing.com. Good job! I’ve had quite a few women tell me that they used that article with great success so I think it will work, but it should only be used as a guideline for pro/carb/fat intake and you’ll have to adjust it according to the rate at which you lose bodyfat. In your webcast, you say that you drop from 3500 calories right down to 2500 when you are doing your 4 week bulk/2 week cut. However, when you are dieting for a longer time getting ready for a contest, do you still drop from 3500 right down to 2500 or do you do it gradually? Really? Don’t you run the risk of plateauing and getting stuck doing that? quick simple (probably stupid) question. When tracking macronutrient intake, should the insoluble fiber content be added? Doesn’t this stuff just get pushed straight through the body anyway? Do you recommend fiber supplementation? What is your opinion of calorie cycling when bulking to stay lean? ie, high day, med, med,low,high then repeat. I’m not a big fan of huge fluctuations of carbs/calories from day to day. it doesn’t give your metabolism enough time to adapt. Is this still your theory on bulking? Well I think that putting on 14 lbs in 9 weeks is just too fast. you can only synthesize muscle tissue so fast. Max rate of fractional protein synthesis in humans is around 0.5% per day; so even if protein degradation is minimal that means a person who has 150 lbs of skeletal muscle tissue is going to have a hard time putting on more than 1/2 lb muscle per week max. Layne what do you think about the setpoint theory? Lately I’ve been mini cutting/bulking and trying to keep myself around 10-12% bodyfat, but I notice my metabolism likes to slow down right when I get to the 12-14% mark, and when I begin a bulk, I tend to add a good chunk of fat and can easily get into the 14-16% range…and then all of a sudden I’m always hot, sweat and get my HR up a lot more during exerecise and basically shows signs of my metabolism speeding up…. point being it seems that my “set point” (if this theory is valid) is around 12-15%….am I spinning my wheels trying to stay 10-12% in the offseason, and spending too much time cutting when I could be bulking in the 14-16% bodyfat range? this will seem out of left field but humor me. How bad did you binge after your show and how much weight did you gain in the first 2 weeks? i’d try to get to 8% then very gradually start increasing calories to re-set the metabolism. I don’t mind giving out most info, but that technique is something I will guard because it is kind of proprietary and something I don’t think most people have a knack for. In your opinion, how long of a break is needed from pre workout stims? Do I need to lower calories when not on a pre workout stim? What’s up Layne, wanted to know if you thought someone who takes btw 2-3 shakes a day would need stuff like milk thistle or sesamin for all the protein going through system, ex. kidneys, liver. no, unless your protein is ungodly high I would not worry about it, there is no evidence high protein is damaging to healthy liver/kidneys. Have you ever read a book called Militiant Bodyopus by Dan Duchaine? If you have what are your thoughts on how he formulates the diet/training protocal? The 2nd question is based on the a book by Ellington Darden: Hit training (I shortened the title). Would you recommend this style of training? I just started this week doing giant sets to break-up the pace and add some intensity. I felt like I was in a sticking point in my training. How long would you reccomend doing this type of training for? I am doing 5days week of this type of training. I will do my primary group then add maybe a few sets of weak point on another part. Layne, when dieting, do you think the type of food your eating doesnt matter as long as your hitting the macros you have laid out for the day? more or less, though I don’t think you should be eating junk food to hit those as it is lower fiber and fiber increases thermogenesis and additionally high fiber foods are more filling than junk food. if the liver and muscle glycogen are full, there will be nowhere else to put the glucose and your body will want to remove it from the blood as fast as possible so if repair and growth is needed it will go toward that but if not, it will be stored as fat. Is this true? mostly true, but far more complex than that and something like that… it’s very difficult to accurately simplify and have everything hold true. I’ve already started keto, how do you recommend i phase back into carbs? part 2: I’m going to start applying your 4/2 bulk/cut concept, its obviously effective for you, I’ll give it a shot.. do you think it matter what my starting point is? (I’m far from these guys like tommy,etc, I’ve never competed nor am i close to being able to)? or would you recommend more of a long term bulk? Hey layne, I’ve been doing this low carb thing for a while but i want to reintroduce carbs back into the diet. I was thinking of maybe doing like two carbs meals and the rest low-carb meals with fats added for energy. The only thing i’m afraid of is that my sugar-grain addiction would be horrendous and i’d just get fat. I want to change up the diet so I don’t stagnate and I think carbs would do the trick. I don’t really know I suppose, what would you recommend I do? Chris Aceto says it is best to have no carbs at a post-cardio meal to eliminate the accompanying insulin spikes and its negative effect on fat loss. Comments? Second thing is, I know you aren’t a fan of fasted state cardio. What about either upon waking or post workout, consuming 10g or so of BCAA’s and then performing the cardio. Does this change things at all? You can have cheerios while dieting?!?!?! I’ve just never heard of that. iv always thought the only carbs on a diet allowed were rice n oats. is there a specific reason why you recommend that tommy (Sporto) eat cheerios pre and post workout? faster insulin spike??? or was it just trial and error, and you found out that carb source works best with him.I’m beginning to think that maybe oatmeal may not be a good primary carb source for my body. i get major gas from eating oatmeal, which could mean that i am allergic to it. any thoughts? layne, should fiber be avoided on refeed days? What kinds of carbs do you suggest to surround cardio sessions? On maintaining muscle mass during a cut. It was written as a precontest prep article but will work great for anyone wanting to drop bodyfat. What cardio to you prefer when you’re cutting down? High or low intensity? Also, do you do it in the morning on an empty stomach, or post workout? Thanks bro, hope the training is coming along well. Hey Layne, Im wanting to keep fat gains to a minimum, I plan on throwing in the cut cycles throughout the year which I think they’ll work well for me. But are there any supps you suggest to help keep fat gain low and that are easy on the wallet? And how much cardio do you recommend during the bulk/cut phases? Thanks. Please watch my webcast (http://www.bodybuilding.com/fun/insidethelife0.htm). I cover this extensively in my webcast episodes. As for a supplement, I think sesamin is a good supplement to keep fat gains to a minimum.